BEEK - Launa vulgo Laun Bohemiae civitas. BEEK, A. / BRAUN,G / HOGENBERG, F. - Launa vulgo Laun Bohemiae civitas. Launa vulgo Laun Bohemiae civitas. - BEEK, A. / BRAUN,G / HOGENBERG, F.
Title : Launa vulgo Laun Bohemiae civitas..
Map maker : BEEK, A. / BRAUN,G / HOGENBERG, F.. Date : The Hague, 1700. Size : 16.7 x 19.7 inches. / 42.5 x 50.0 cm. 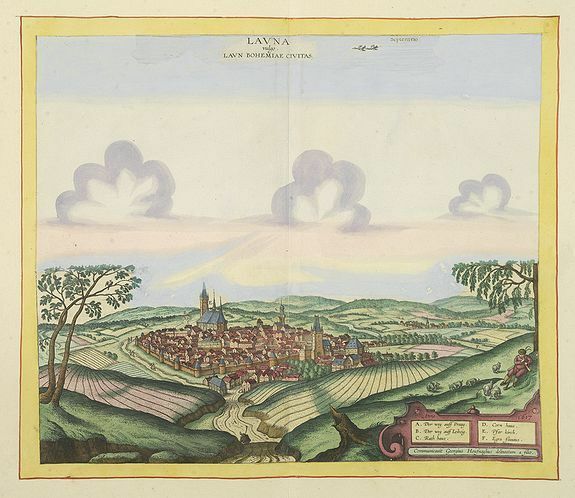 Description :Bird's-eye views of Louny in Bohemia by G. Hoefnagel. The copperplate was made for Braun and Hogenberg's townbook. However there the print has been transformed by the engraver and publisher of prints, Mrs. Anna Beek of the Hague. She enlarged this print, originally published in 1620, and coloured them in pastel colours, adding extensive clouds and brilliant yellow borders. The height of the print is enlarged with c.8cm (3 inches). This way of enlarging prints is also known from the famous Van der Hem/Prinz Eugen Atlas and those in the former Royal print-collection kept in Jemniste in Czechoslovakia. Condition : Contemporarily laid down on larger paper the engraved title from the original print almost invisibly integrated in the enlarged part. Mint.